The Imaginarium’s (2) Bergey Excel 10 turbines are classified as Small Wind Turbines by the American Wind Energy Association (AWEA) and are significantly different from utility-grade wind turbines in physical attributes such as height, rotor diameter, rotation speed and power rating. 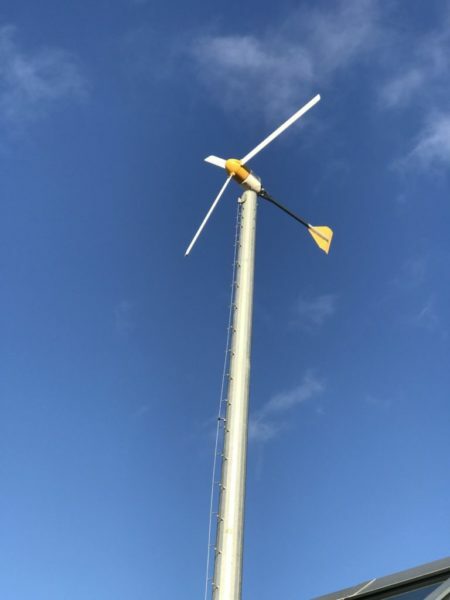 Our Bergey Excel 10 turbines, installed at a 105 ft. hub height, have a 23 ft. rotor diameter, a power rating of 8.9kW, and a sound rating of 42.9 dB(A) which is equivalent to a refrigerator or dishwasher at a distance of 100 ft. from the base. The Bergey Excel 10 Small Wind Turbine is certified by the Small Wind Certification Council (SWCC), meaning it was tested and designed following the AWEA performance and safety standards. It was first certified in 2011, and has successfully renewed the certification every subsequent year. During periods of high wind speeds (> 35 mph), the Bergey will “Auto-furl”, which means the rotor turns away from the wind (it looks like the tail is bent). This motion protects the turbine bearings from overturning and the system from voltage surges, and is a unique feature patented by Bergey. The turbine still produces power when furled up to wind speeds of 45 mph. Made in the USA! The Bergey Excel 10 Small Wind Turbine is designed and manufactured by the Bergey WindPower Company in Norman, Oklahoma. 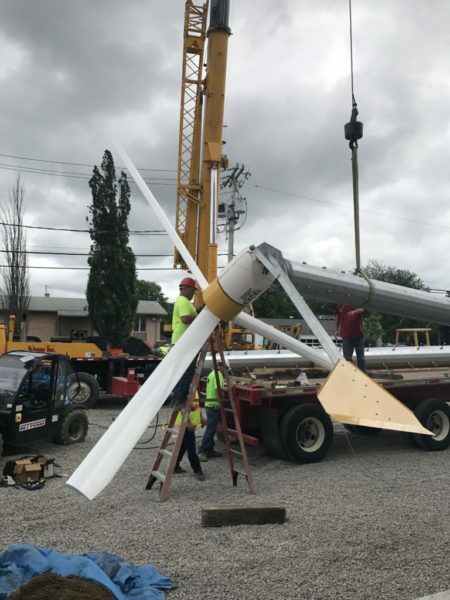 Bergey WindPower is the oldest and most experienced manufacturer of residential-sized wind turbines in the world, with their first model coming to market in the late 1970’s. 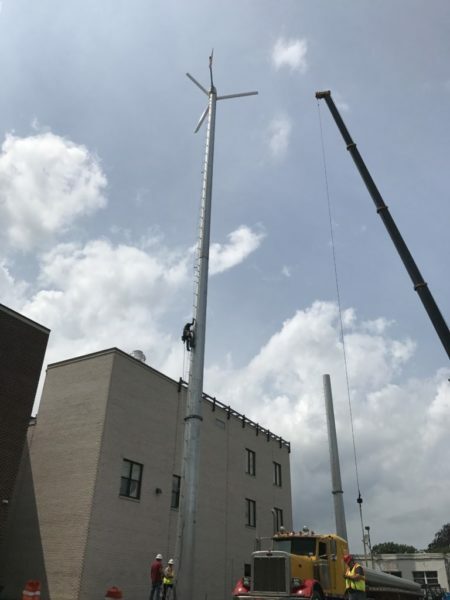 The Fred A. Nudd Corporation (Ontario, NY) designed and installed our towers, and O’Connell Electric (Victor, NY) installed and maintain our Bergey’s. According to the NYSERDA’s Wind Resource Report, our location is rated as an “Average” wind resource. At our 105 ft. hub height, we expect to generate an average of 17,800 kWh of electricity annually, which is approximately 35% of our demand. Visitors can learn more about WIND POWER by watching the “Wind Power 101” video in our ECO Lounge. We also have a 1kW Bergey turbine on display on the 1st floor, which is 1/10th the power of the two outside.